Jimmy Casas (@casas_jimmy) speaks often to the power of the “three Rs” relationships, relationships, relationships. So true, both in education and life without a solid relationship foundation what do we really have? Nothing. While relationships have become a buzzword lately it’s imperative these are genuine and not just “going through the motion” by “checking off the box.” The students we all serve can spot phony in a nanosecond. When we are truly invested in them as individuals far beyond mere data points, they know. If you see my Twitter feed enough you know I send out daily motivations often early in the morning. Monday – #CelebrateMonday created by my pal Sean Gaillard; Tuesday – #TootlingTuesday created by my friend and district colleague Renee White; Wednesday – #WednesdayWisdom; Thursday – #ThoughtfulThursday; Friday – #FF (Follow Friday); Saturday – #SaturdaySpark and Sunday – #SundayMotivation. All of these daily tweets are designed to provide positivity in some fashion. Celebrating the great aspects of the school, regognizing district colleagues going above and beyond, inspirational quotes or sayings, providing PLN educators who might be beneficial to increase their personalized learning, the list goes on. While daily tweets of inspiration, praise and thought are one thing how do we put relationships into action. Enter my work with two projects at both the elementary and middle school level. In 2011, when I was new to Twitter one of the first interactions I had on a “global level” (educators beyond my district and state level) was Angela Maiers. Angela had just rolled out her You Matter initiative and I was blown away. Her work inspires me greatly and through bringing her You Matter movement to my previous school caused me to blog about the experience which led to a conference call with Angela, myself and school stakeholders. Angela’s overarching work and her Choose2Matter organziation (http://www.choose2matter.org) transformed the student and staff culture at Wendell Creative Arts and Science Magnet Elementary and I’m so grateful for the opportunity Shane Barham afforded me to bring this initiative to his school. 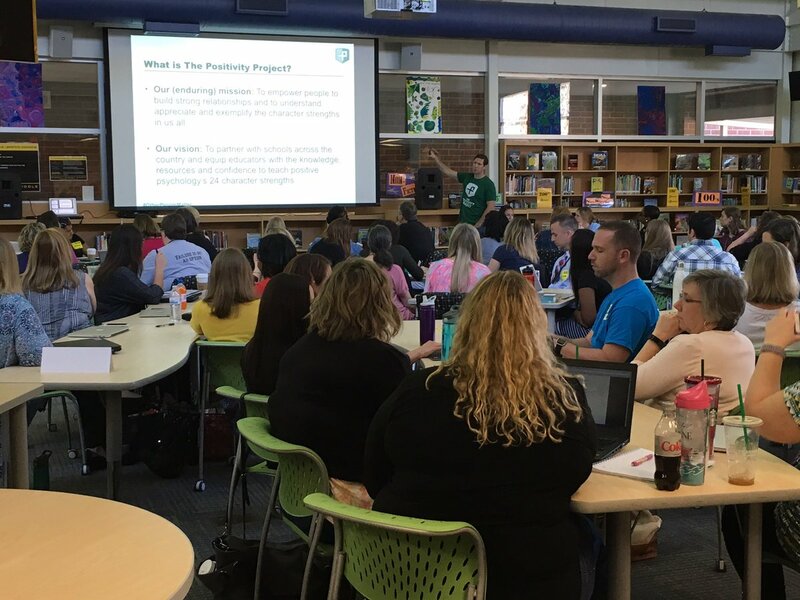 When I transitioned curriculum coaching roles within our district from elementary to middle school levels one of the areas of attraction that led me to Carroll Leadership in Technology Magnet Middle School was the school had recently integrated the Positivity Project (https://posproject.org) I immediately saw the deep value in relationship as well as clear positivity of the initiative. What was even more powerful once I arrived at the school was the ability to intertwine Positivity Project (P2) with our Leader in Me/Seven Habits which is part of of our magnet theme. Amazing, right? Excited to see where this program takes our school in 2017-18. Even more exciting is as a pilot school in our district we recently invited over 30 other schools in our district to our school to learn more about P2 from our student leaders and the president and co-founder of Positivity Project, Mike Erwin. From that workshop we now have several new schools in our district planning to implement P2 for 2017-18. Strength in numbers – and a growing Positivity Project PLN within our own district. The #OtherPeopleMatter initiatives are powerful. While all the inspirational tweets, blogs, initiatives, and are talk have great power none of these have true value or merit without genuine, ongoing relationships. Relationships with students, staff and community stakeholders. How are you doing in that department? Remember, the students we all serve can spot the artificial quickly. Be honest, reflect, improve. We all can. We are better together. After all, #KidsDeserveIt. Inspiring post! The #YouMatter movement is such an important message for our students and our school communities. I love it when my students use this #…our room parent planned a cool activity for Valentine’s Day where students made cards for a local nursing home. Several students included the #YouMatter message without prompting 🙂 It was so cool to see Angela’s message extend beyond our classroom walls. I love that Maya A. Had roots in NC. What a treasure she was. I love your perspective on Relationships. It requires us all to check our egos, positions, and perpesctives at the door.